Sweet Home-Chefs: Food Wastage : Stop It! Home » Tips » Food Wastage : Stop It! Food wastage is a serious issue that needs to be addressed by every household. According to a report in The Star newspaper in 2011, it was estimated that “Malaysians discard about 930 tonnes of unconsumed food daily." Worldwide, the figures run up to one-third of total food production, based on findings by the FAO. Imagine that amount of food being distributed to starving families and the impact it could have on combating food scarcity that is near inevitable with growing numbers of the human population. 1) Skip The Buffet Line especially if you're a fussy or a small eater. Buffets are the easiest place to waste food. The many varieties on the table tempts us to overload our plate and stuff ourselves full. Admit it, many of us have been guilty of not finishing our food at one time or another. Picky eaters are equally guilty when they push aside what they deem to be unedible because "it isn't tasty" and head for tastier treats on the buffet table. 2) Plan What To Buy, always bring a shopping list . Overstocking on fresh produce is a surefire way to waste food if you cannot finish it up before it rots. Buy little but often, or plan grocery purchases around expiry dates. For instance, I would stock my fridge with a variety of vegetables that I know has different shelf lives - like celery which lasts for weeks, spinach which stays fresh as long as three days and the asparagus that can go up to seven days. The trick is to eat the spinach first, the asparagus second and celery, last. 3) Stop The Habit Of Pressing Fresh Produce To Test For Freshness or Ripeness. How often have we walked past the fresh produce section only to find fruits with bruised brown fingerprints? When you press a fruit or vegetable, ensure that it goes into your shopping basket too because there is a high possibility that it will bruise and you are guaranteeing that chances for it to be sold is nil. Use other means to test for freshness or ask an expert. I usually go by using my sense of smell, looking at the colour and touching it. If I land myself with an unripe fruit or if it's not too fresh, I'll find alternative ways to use it like make a jam or cook it into a sauce. 4) Be Versatile With Recipes. Don't buy items that you're going to use only once. If a recipe calls for one piece of dried wood fungus and it's not something you use often, don't buy a whole packet thinking you will. Substitute it with something you would use regularly such as the more common mushroom. 5) Make It A Habit To Clear Leftovers. Conduct regular spotchecks on refrigerated leftovers which should not be kept for too long. Plan your day's meals around it and trust me, you'll be happy to see how much space you still have in the refrigerator and you'll be pleased with yourself for not throwing food away. There are many ways to use leftovers to make a perfectly good and healthy meal. Besides sandwiches, I use it to add flavour to stir-fry dishes. And if I have time on my hands, I'd roll my sleeves up to make our Chinese New Year favourite, the Kiam Chye Boey, a salted vegetable stew where the key ingredients are leftover meats. World Environment Day falls on 5th June this year. 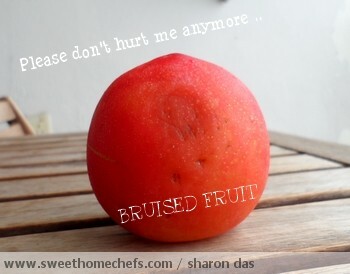 The blog owners of Sweet Home-Chefs join hands to raise awareness against food wastage. GreenUp, a green initiative powered by the UN Environment Programme (UNEP) is running a "Love Your Leftovers" competition in support of the THINK.EAT.SAVE - REDUCE YOUR FOODPRINT campaign. 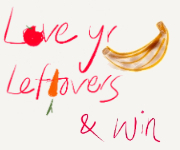 Share your leftover recipes to win mystery prizes and a chance for your recipe to be included in the Love Your Leftovers recipe book! Click on the image to find out more.